BRICS countries have traditionally played a key role in the world diamond industry. Cooperation within the five countries in the diamond sector is gathering pace, with India and China, traditional diamond cutting centres, now making up a considerable part of the global demand for diamonds. BRICS is not only a political and economic combine of like-minded nations, but also the world’s largest consumer market, with 43% of the planet’s population. Around a third of all items of jewellery with diamonds are found in the five countries, estimates indicate, and this figure could rise to 50% over the next half decade. The firm Bain & Company and the Antwerp World Diamond Centre predicted in 2012 that this demand for diamonds would grow to more than 60%, to $26.1 billion by 2020, primarily due to increase in demand from the growing middle classes of China and India. According to Ilya Ryashchin, Vice President of Alrosa, China and India remain the main market drivers today. If nearly a quarter of the world demand for diamond jewellery today is in India and China, then this share will grow to approximately 40% in the medium term. Cooperation in the diamond trade and in the manufacture of diamonds and diamond jewellery within the BRICS bloc has not assumed concrete shape. However, all the prerequisites are already in place. Russia and South Africa are the largest diamond-mining countries and India is the largest centre for diamond cutting and jewellery making. China is not only a production centre for jewellery, but also has the second largest diamond consumer market in the world after the USA, in terms of volume. In December 2014, at the World Diamond Conference in New Delhi, which coincided with Russian President Vladimir Putin’s visit to India’s capital, the countries’ leaders, who attended the conference, laid the foundation for a renewal of cooperation in the diamond sector. Addressing conference delegates, Putin noted that nearly 50% of AK Alrosa’s raw supply is located in India or within companies controlled by Indian capital. Alrosa is the largest Russian diamond mining and sales company. Alrosa signed a long-term agreement on direct trade in diamonds with 12 Indian companies at the International Diamond Congress. “This is a landmark agreement for the Indian diamond industry. India produces more than 70% of the world volume in diamonds, so for Indian diamond cutting enterprises, it is very important to obtain direct access to raw materials,” said Vipul Shah, Chairman of India’s Gems and Jewellery Export Promotion Council (GJEPC). The total volume of Alrosa’s trade with India, counting direct and indirect supplies, was recently estimated at $700 million. According to Andrey Polyakov, Vice President of Alrosa, this figure applies to direct supplies to India alone, after signing of direct long-term contracts with Indian companies. Indian Prime Minister Narendra Modi, speaking at the World Diamond Conference in Delhi, called for world diamond producing companies, including Alrosa, to expand their business in India, concluding contracts for the direct supply of raw diamonds to Indian companies skirting the middle-men in the conventional centres of diamond trade like Antwerp and Dubai. 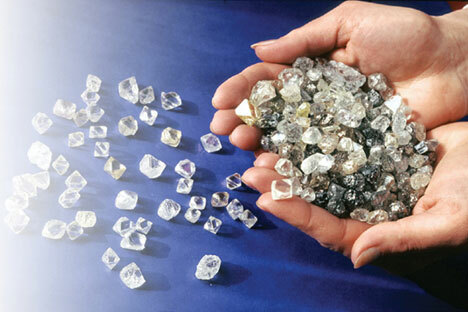 Indian authorities promised to create a special diamond trade zone in India with simplified taxation regulations. Putin urged Indian companies to open diamond cutting centres in Russia. The country is the largest diamond miner in the world but has barely 4% of global diamond production. India, on the other hand, cuts and polishes over 70% of the world's diamonds. Experts however say that diamond cutting in Russia is even less profitable than in India. According to Maxim Shkadov, head of Russia’s largest diamond cutting enterprise Crystal, profitability in Russia, even in the best of times, has not exceeded 5%. Ramesh Shah, owner and CEO of Excel Overseas, owns a small diamond cutting enterprise in Moscow and believes that there are prospects for Indian companies in Russia, although profitability of the diamond industry in Russia is reduced mainly due to the unstable rate of the ruble. “The cost of production in India, in any case, will always be cheaper than in Russia,” said Jitender Kumar, head of the Moscow office of Brilliant Diamond. “Even though we have to pay customs duties and other charges, taking into account the cost of labour in India, as well as an existing world-class infrastructure in India, production is more profitable.” Kumar said the Russian market and the global market is now in crisis, but the players are hoping for a speedy recovery. Expanding cooperation in diamonds between BRICS nations, he feels, will help restore positive growth trends. BRICS countries can cooperate not only in trade but also in regulating the trade, and the development of more effective mechanisms to identify fakes. The diamond industry is going through hard times. Mining companies and diamantaires are equally concerned about uncut diamond reserves and threats from the synthetic diamond industry, financing problems for the diamond industry and falling demand for diamonds among consumers. The world’s largest diamond producers, ALROSA, De Beers, Rio Tinto, Dominion Diamond Corporation, Lucara Diamond Corporation, Petra Diamonds Ltd and Gem Diamonds announced in May the formation of the Diamond Producers Association. In a joint statement, the companies announced they were combining their financial and marketing efforts to support the development of the diamond sector, which faces numerous challenges. The main problem is the falling demand for diamonds in the major consuming countries. In 2013, the World Federation of Diamond Bourses launched the World Diamond Mark. The non-profit organization aimed to boost the share of diamonds and jewellery in the luxury market. Alexei Popov, Chairman of the Foundation and president of the Moscow Diamond Bourse, said India is one of the largest investors in the programme as they seek to raise their volume of trade globally.